Apollo 14 astronaut Ed Mitchell. The U.S. government is suing an Apollo astronaut for illegally keeping a camera he used during a moon mission and trying to sell it for profit, according to news reports. According to the lawsuit, filed in Miami federal court on Wednesday (June 29), former NASA astronaut Edgar Mitchell has put a camera used to explore the moon's surface up for sale at the British auction house Bonhams, Reuters reported. But the camera, used during the 1971 Apollo 14 mission, is the rightful property of NASA, according to the government. "All equipment and property used during NASA operations remains the property of NASA unless explicitly released or transferred to another party," the government suit said, according to Reuters. 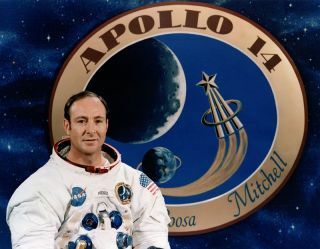 NASA insists it has no record of giving the camera to Mitchell, though Mitchell's lawyer, Donald Jacobson, said NASA presented the camera as a gift to Mitchell after the mission 40 years ago. The government alleges in the suit that it has made repeated requests to Mitchell and his lawyer to return the camera, but has received no response. Bonhams, which estimated the camera would sell for $60,000 to $80,000, has withdrawn the camera from saleuntil the lawsuit is resolved. Since retiring from NASA, Mitchell has gained some fame for his belief in the existence of extraterrestrials. He has claimed that aliens have visited Earth and made contact, and that many of the alleged UFO sightings have been actual alien spacecraft, including those reported in Roswell, N.M. in 1947.